Goodness me, I have had a spring in my step this week. Good news does that to you, I'm sure you will agree, together with the warmth of human kindness. Your generous, supportive comments have touched me more than I can say. Writing 'thank you' to each and every one of you seems a little inadequate, I'm afraid, but these two words are truly heartfelt. young colt and dancing on my tiptoes. Excuse me if I raise my voice here but just look at my NEW SHOES! Every autumn I relish the ritual of purchasing a pair of Fairysteps handmade shoes. Oh, the joy of choosing which whimsical shoes will become my favourite walking companions each year! There is something so intrinsically "Elves and the Shoemaker" about Ren and her artistic talent; even her blog has a fairytale aura about it. She is a hard-working lady too. I have sometimes wondered if the little folk have gifted her with the ability to thrive on no sleep for she is always busy stitching her beautiful leather in those jewel-like colours, sitting cross-legged on her workbench, perhaps, and when the last stitch is in place she adorns some with a beautiful organza or silk ribbon. Perfection. Not only are they exquisitely made but they are blissful to wear. As light as a feather and as soft as kid gloves. Now I am saving up my coins to buy some boots for this coming winter. Sticking to my heels most glorious days is Angélique my other faithful walking companion. Actually like most two year olds she prefers to hop, skip, and jump instead of walking. She has taken to wearing this beaded beret I recently knitted for her all the time. I made it pale blue with ice-coloured glass beads to remind me that she is my winter daughter. I love this feisty child so very much who now claims she is no longer a baby but a little girl. Sigh. I am all higgledy-piggledy this week and a little bit excited about the new hare orders I am receiving. I, like Angélique, am hopping and skipping between the seasons as I stitch (and prepare to stitch) a spring Hare with a touch of Easter, my third Mademoiselle Bloom (with a fourth in the pipeline), a small family of autumnal hares, and, dare I whisper, some Christmas creatures with silvery stars and snowflakes. My imagination is having a ball. A few weeks ago I finally got organised enough to set up a facebook page for my teeny tiny business Madame Millefeuilles. So if you are on facebook it would make me so happy if you headed over there and 'liked' me. If you come and join me I will be sharing regular snippets of inspiration with you. Thank you so much! 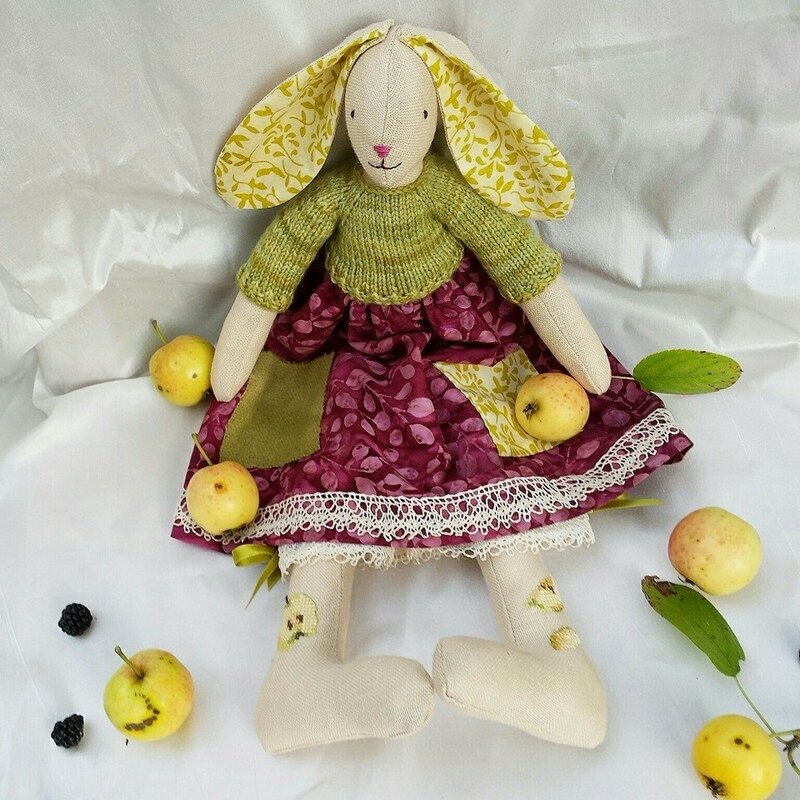 Edit: would any of you be interested in a special edition autumnal hare giveaway, I wonder? I think this year you must have sensed my reluctance to let go of summer. I needed to continue to feel the sun on my skin and to play my favourite game of Wishful Thinking. The thought of facing up to reality was a little hard to bear, you see. You are also called "fall", from the Old English faellan, to fall down, which leads back through time to the Indo-European phol, to fall. Fall is the time of course when leaves drop from the trees. But there is that other fall, the one in the Garden of Eden where Adam and Eve hid their nakedness with a fig leaf, remember? Flurrying leaves and the Harlequin beauty of your trees help us forget about passing time and the temporary death which winter brings. With the arrival of each autumn I feel we slip and slide as though on wet leaves down a steep hill towards the winter solstice. Time seems to accelerate. Breathing becomes shorter and sharper. Winter, however, brings its fair share of beauty and enchantment. Thankfully. Now, I am at peace with you. I have gorged myself on late summer's brilliant blue skies, bleached cornfields and blazing, glossy rose-hips. I have smiled like a lighthearted child at september's generous warmth and confetti-coloured wildflowers. I have marvelled at the seedpods which decorate our countryside and the Clematis vitalba - or Old Man's Beard - with its trailing silver seed-heads draping our surrounding hedges. I am no longer afraid to welcome you. Today is autumn. Today my husband received the good news we were almost too afraid to hope for. Some of you may remember how I shared the frustration of our two-and-a-half year wait here; a lingering legal case of unfair dismissal which threatened to linger a lot longer than we could bear after his ex-boss decided to appeal the court's original verdict in favour of Mickaël. I am so relieved to share with you the fact that he has won for the second time and, dare I whisper, has been awarded twice as much financial compensation this time round. Such sweet relief as you can all imagine. So now we may face autumn with lighter hearts. To celebrate I leave you with these images of Mademoiselle September Meadow created for a truly lovely lady who lives in an old steading deep in the Aberdeenshire countryside. She won me over with her descriptions of surrounding meadows filled with ox-eye daisies in summer and blushing rose-hips now. This little creature wears the same garb as my summer hares but with distinct autumn colours. She marks the transition towards the different styled autumn hares I am currently working on. Some will be adorned with these beautiful hand dyed silk ribbons. By the way, if you're reading Madelief, Susan, and Jeanne; you will be receiving your long-eared orders soon; I promise! A final picture taken by Tristan of my husband MIckaël photographing Héloïse at the Chaumont Garden Festival in August. He may be a stubborn, overly dynamic Breton but my goodness he is wonderful. Please cross your fingers if you have the time on Sunday. Héloïse will be auditioning at the regional academy of music and theatre where she hopes to study acting outside school hours. I wish each and every one of you a wonderful autumn. I don't know if I'll be keeping this new Millefeuilles banner for long. I know this little rosehip bearing rabbit wove some potent magic upon me as I found myself, as if bewitched, stitching a combination of colours which do not usually find favour with me. But on reflection these are the colours of early autumn, surely; butter-yellow, vivid scarlet and plum jostling for attention against the still predominant green pigment of chorophyll. What do you think? Mother Nature has been drawing us out each and every day. That special september sunlight is too precious to ignore. We cycle along the Loire river banks - the only level ground around our hilly parts - we tread familiar bridle paths through the vineyards and embrace new secret trails, picking blackberries and trailing our hands through brittle long grasses. The leaves on the vines are beginning to turn but the green grapes have a few sun-drenched weeks of respite before hoards of grape gatherers descend upon the regular rows sending pheasants and roe deer scuttling away. Our glorious countryside, more bleached than green now after weeks of heat, inspired me to knit the leafy shawl you can see above. Cedar Leaf Shawlette is the work of Alana Dakos. The Madelinetosh DK yarn in the Filigree colourway lends itself beautifully to the drape of this crescent-shaped shawl worked in short rows with the leaf border added sideways once the main body is finished. It is a pleasure to observe the leaves unfold gently as you knit; the repetitive pattern is never tedious. Simply perfect to welcome in early autumn, don't you think? For those who are interested my Ravelry notes are to be found here. On a sultry day two weeks ago we headed off to the Chaumont-sur-Loire Garden Festival. This year the theme - "Gardens Of Delight, Gardens Of Delirium" - promised to be both enticing and intriguing. As we eagerly traipsed around the twenty-six show gardens we were gently pulled into an enchanted world where fairy tales and culinary delights reigned supreme. One garden set the stage for Antonin Carême's elaborate marzipan cakes displayed in his eighteenth-century Parisian pâtisserie window and modelled on the ideas he would take from his passion for architectural history books. Another, poetically named after the legend of Sleeping Beauty, was composed of thorny white Climbing Iceberg rose bushes and giant purple thistles to symbolize the hedge of thorns which surrounded the princess's slumbering castle. In another garden a fairy, wearing a brightly-patterned pinny, ruled over her magical vegetable patch in which dozens of mouth-watering recipes dangled from tree branches above magic pumpkins and giant artichokes. The Garden Of Sensual Delights was an orchard of closely planted fruit trees with a four-poster bed set on a base of red roses. Most enchanting. I would be tempted to confess that sometimes the written descriptions, displayed at the entrance of each garden, were much more evocative and exciting than the gardens themselves. I thought at the time this might have something to do with the fact that I chiefly garden with words and that I enjoy reading about gardens in particular. My husband and Héloïse, however, agreed that they too had been more seduced by the words. If any of you have also visited Chaumont this year I would love to read your impressions. Before I leave you for now I would like to tell you that I am busy making up, alongside some lovely custom orders, a family of autumnal hares dressed in jewel colours gleefully ready to face the turn of the season. I have also put up a couple of limited edition hares on my Gallery of Hares page (you will find it just under my Millefeuilles banner) which were made for two lovely ladies a little while back. I also intend to post here a little more frequently. I am looking forward to that enormously.